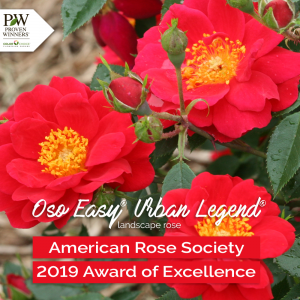 June 6, 2018 - Proven Winners® ColorChoice® Oso Easy® Urban Legend® Rosa has been honored with the 2019 Award of Excellence by the American Rose Society. The competition accepts submissions of miniature and miniflora roses which have been in commerce for less than one year. Those chosen to compete are evaluated for two to three years in eight AOE public test gardens and two private gardens, which are spaced geographically across the United States. Roses may be entered in a “no spray” division, a “preventive spray” division, or both. Each public garden has an AOE supervisor and five evaluators who score the entries on eleven criteria four times during each growing season. At the end of the trial period, Awards of Excellence are given to deserving entries, with a maximum of five per year. The official public announcement of the Award of Excellence winners was made at the ARS National Miniature Rose Show and Conference in May, where Oso Easy® Urban Legend®, a cherry red miniature, was declared the top rose in the “no spray” division. A prolific rebloomer, Oso Easy® Urban Legend® features double, scarlet-red flowers with bright yellow stamens. Bred by Christopher Hugh Warner in the United Kingdom, Oso Easy® Urban Legend® is a Spring Meadow Nursery introduction and is and one of 12 varieties in the Proven Winners® ColorChoice® Oso Easy® line of roses.